Baby, it’s cold outside. But that doesn’t stop [Grissini] from listening to some tunes when not indoors. He added headphones to a pair of ear warmers. We guess you could call them ear muffs, which is where the name comes from. But these are the newer type that wrap around the back of your head. [Grissini] picked up a set of headphones that similarly wrap around the back of your head. After pulling the speakers out of their plastic enclosures he needed a way to soften the sharp edges when they’ll be pressed against your ears. Sugru once again shows its versatility by providing a soft, self-bonding, and moldable surface. The last step is dead simple, as the ear warmers already have a fabric pocket by each ear perfect for accepting the speakers. Now we need this to go one step further, by making them wireless. We figure hacking in a bluetooth headset board would make it work with your cellphone. Or you could roll your own minimal MP3 board and house it in the part that wraps around your neck. Yes, there is a magical pocket that just so happens to be “perfect for accepting speakers”. Well, that’s cause they were made for that exact purpose! In fact, I had a pair of these “newer style” ear muffs well over 10 years ago, and they were made for putting headphones in back then. I’m not quite sure what the news flash is here. They just wanted an excuse to put a picture of someone putting “muff” on their ears. they just wanted to annoy you, because they know how much you hate it when people make things from scratch. why not add a mic. and a control button with the bluethooth and market the hell out of them in cold climates! never having to take off your gloves and dig your phone out your pocket in freezing temps again would be nice! Those could definitely do with some Bluetooth. I tossed the internals of a Rocketfish BT headset into my pair of sr-225i’s last winter (because i live in Canada, where it gets cold enough that the nice thick cable on the headphones actually freezes to the point that i can’t turn my head without them falling off…) Took almost no effort compared to other mods i’ve done on them and works like a charm. Somewhat reminds me of these… I’ve had them for a few years now. Yup. 180s Have them also. They are made to put speakers in. They sold the speakers separately. But now it depends what kind you get. just to make sure… it’s pronounced ‘muffins’, right? Why not just use proper _headphones_ ? I definately like this. I also had this idea after hafing a set of these ear muffs but I also use s bluetooth headset. You can get a nice bt headset from walmart.com for $30. How did this make it on here? I put a book underneath one of my old monitors because the stand wasnt high enough to sit level with the main screen even though they were the same size. I even went through my small library of books and found one that just happened to be the right height. Where is my HAD article? Do you have a blog link? A picture and maybe a youtube video with royalty music that won’t play in other countries is also a nice touch. Also, to get posted even faster, you need to put it on a site that has instructions for things as its primary purpose. 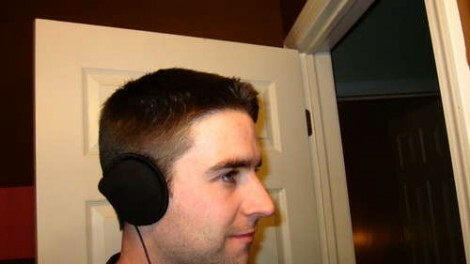 Of course, he did actually hack into the headphones and do some cutting and reshaping (with a dremel). He didn’t just slide ear buds into the 180s and call it a hack. I like it, and I may do it with a pair of headphones that lost the ear cushions (no other use for them). It will be a heck of a lot cheaper than spending $35 on 180s that have it built in. Using the Sugru seems to actually be useful, I thought it was kinda pointless until I went and read the article. I’d like to muff your fones.